All rates are based on a family of four (2 Adults & 2 Children under the age of 18) staying in one Camper, RV or Tent. 1 WIFI pass code included for length of stay per site. Additional codes available for additional fee. Extra persons will be charged $5 per person/per night for tent & campsites and $10 per person/per night for cabins. There is a $3 per person visitor fee. No additional charge for pets. Min of 1 night fee deposit on stays less than 3 days. $100.00 deposit from 4 days to 1 week. $200.00 deposit for longer stays. Cabin stays of less than 1 week must be paid in full when making a reservation. $200.00 deposit on cabins for 1 week or longer. 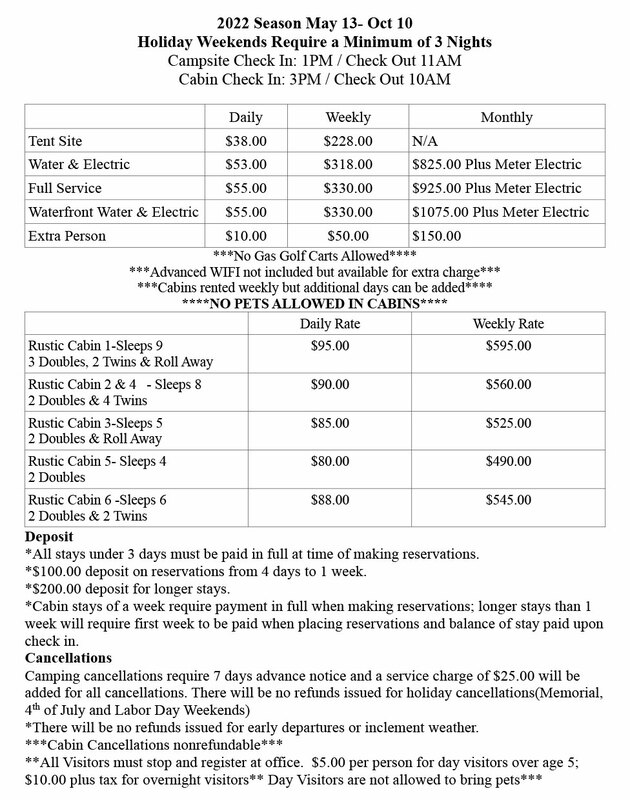 Camping cancellations require 7 days advance notice and a service charge of $15 will be added for all cancellations. There will be no refunds issued for Holiday cancellations - Memorial, 4th of July and Labor Day weekends. There will be no refunds issued for early departures or inclement weather.